Bai didn't even realize he was yelling until the clerk fled in tears. He was not surprised when Ressa appeared in his doorway a dozen tenticks later, an expression of dark disapproval across her fine features. She crossed her arms, and Bai wished that he'd never encouraged her to be forthright about her opinions. Not that he'd ever needed to encourage her much. "What was that?" Ressa asked firmly. Bai didn't have to ask what she was referring to. "He missed several points on the justification form. That kind of carelessness means more work for all of us, and unnecessary delays and appeals." He sounded defensive to his own ears. "So you drove him crying out of your office?" Ressa's eyes narrowed in challenge. She walked into the office and closed the door behind her without asking Bai's permission. He scowled at her as she picked a justification form off of the floor, moved a mug back from the edge of his desk and then gracefully claimed the chair across from him. "Tell me," she commanded him. Bai put his elbows on the desk and sunk his head into his hands. He outlined his encounter with the bright and curious Amaroin, and his dismay when he realized the boy was unlicensed. "I know her," Ressa said. "She lives in the building past the flower store. Her son moved here with her, and a young bride, I think, and went to try to make his fortune in the time mines. He died there - she got the housing license as a settlement. I... never guessed that there was a child involved. I don't know what happened to the wife." Bai didn't have to explain to her what would happen to the boy. Unlicensed, he would be removed from his grandmother's care unless she had the money to pay an after-fee, which was highly unlikely. Amaroin would be available for adoption to an approved couple at that point, but his chances were slim. Infants frequently found happy homes, but older children tended to be maladjusted, and rarely appealed to people looking to adopt. Unwanted as a citizen, Amaroin might end up in the military, brainwashed into service, or even recruited to some of the more unsavory branches that the government didn't speak of. "You didn't call the monitors?" It was the question Bai had been wrestling with since the meeting before his midday meal. He hadn't called the Monitors. It had occurred to him only briefly, despite the fact that he was License Master of Affamarg, upholder of all local and regional licenses in the city. At the time, it seemed perfectly rational to arrange to meet them later, under some genteel pretense of taking the boy to a Science Garden. He struggled to explain this to Ressa, at the end only able to say, "I really, truly believed that I was giving them a last day to say goodbye," he said. "The law says I have twenty hours to report them, and my only thought was that I should give them every tick of it. I didn't even consider that they might not come back until I was standing here at my desk looking at a pile of justification forms." Ressa laughed, to Bai's surprise. "I believe you," she added quickly. "It's just... so like you to expect them to be there." There was a note to her voice that Bai didn't expect and couldn't decipher. "Five years you've been in this position, and you're still as optimistically naive as a first form." "I should call the Monitors now," Bai said with great resignation. He had been struggling with the issue all afternoon, and he knew the answer. Ressa frowned. "You do have twenty hours," she reminded him. "And... maybe they'll show up. Your faith in people hasn't always been misplaced. It will give me some time to check a few spots in the files, and make sure nothing has fallen through the cracks." It was the tiny piece of justification that Bai had been floundering for, and he clung to it. "Yes," he agreed. "You're right. They might be there." 'They will,' he hoped, as hard as he could. Ressa stood. "We're tenticks from closing time," she told Bai. "You're useless for more work. Go home, or go for a walk along the river or something, to settle your mind." The licensing office was in a perfect line from the carnal guild rooms at the House of Scarlet Wings to Bai's quarters, a fact which never failed to amuse the man. He would have walked past the imposing double arches without a second glance, but a movement in the doorway made him pause and watch in curiosity as one of the smaller, inset doors swung open and Ressa came out, rubbing her eyes. Dawn was just beginning to color the sky. She saw him before he could comment. "Bai! What are you doing here at this hour?" Bai found that he had no desire to explain his unscheduled trip to visit Olarali to her, and he was regretting the bottle of wine that they had split during a break for refreshment. "What are you doing here?" he countered. To his surprise, Ressa's face split into a brilliant smile. The lines of exhaustion vanished from her face. "I found it," she said in quiet triumph. Come to think of it, Bai wasn't sure Olarali had drunk any of the bottle. He felt hopelessly muddled and didn't think it was entirely because Ressa looked so gorgeous smiling like that. "Found what?" Bai blinked and took his glasses off to pinch the bridge of his nose. "What?" "Amaroin's license! The little boy you met this afternoon..."
"I remember the time-blasted boy," Bai said gruffly. "He wasn't licensed, remember?" Bai had not thought that Ressa's smile could grow more brilliant, but it did. "He was," she insisted. "His parents applied for it before Amaroin's father went to the mines. It was granted, but no one ever came to pick it up. By the time any follow-up was done and we caught up on the files, he was dead, and his wife had disappeared. Possibly, she died in childbirth, or maybe she went back to the desert. Either way, his grandmother received the housing license as part of the mine survivor settlement, and no one guessed that she was raising Amaroin in those rooms." "Bai," she said gently. "He's licensed. Completely legal and --"
Bai let out a whoop of laughter, and without thinking about it, swept Ressa into a crushing embrace, lifting her up and swinging her halfway around as she protested and laughed. She was a good hand taller than him, and not light; he nearly embarrassed himself by dropping her. "Stop, Bai, stop!" she exclaimed, and when Bai released her, her face was red in the light of the time crystal globes in the archway. "Is there something wrong, here, citizens?" Bai turned to grin at the approaching Monitors. Ressa tucked her dark hair back up into its tidy bun and shook her head, still laughing weakly. "Nothing's wrong, Monitors," Bai said broadly, enjoying their change in demeanor as they recognized him. "Nothing in the entire Empire." "Ah... very good, License Master Baison," one of the belted Monitors said respectfully, if a little bemused. They hastily retreated to the far side of the foot-street. "Can I walk you to your housing?" Bai offered to Ressa apologetically. Ressa shook her head, looking half-uncomfortable and half-amused. "I think I'm safer on my own," she teased. "I'll see you in a few hours." Bai looked at the sky and grunted. "Ugh, you're right," he agreed. "Good morning, Clerk!" "Good morning, Scientist," she echoed in tone. Bai walked the rest of the way back to his housing whistling. "You're all dressed up," Rai greeted him. "How can you tell" Bai asked. His brother was licensed blind, with vision so poor that he couldn't possibly know that Bai had put on his formal robes and a fine, embroidered undershirt. Twins, the two brothers looked very little alike. Rai was tall, slender and fine-featured, with golden hair and pale, soulful eyes. Bai, by contrast, was coarse, big-boned and clumsy-fingered, with thin, mousy brown hair and brown eyes. "You smell," Rai reminded him. "It's the amber scent I sold you two years ago." Bai laughed at himself for forgetting. Rai's shop was filled with fine exotic scents, and of course Rai would notice that he'd splashed some on with his fine clothing out of habit. "So," Rai prodded, organizing the counter display by touch. "Why the holiday dress?" Bai knew that showing Rai the license would accomplish nothing, so he related the story in whole, starting with the chance encounter the day before. "He grilled me like a Science Leader," Bai remembered with a laugh. "Wanted to know why grass only grew knee-high, and why butterflies were lucky." "But unlicensed?" Rai was as horrified by the idea as Bai had been. He had stopped fiddling with his wares, and was listening with all of his attention. "So I thought! But Ressa found his justification forms in the dead files - spent all night searching for them. The license had already been approved. But his father died and his mother disappeared, so there was no one to give it to. The license was destroyed when it expired, but the original, approved forms were still in the files!" Rai was quiet. Bai felt cheated; clearly this was deserving of more excitement. "So, here I am, ready to go give this boy an entire new life with a piece of paper," he prodded. "It's very convenient, don't you think?" Bai digested that for a moment. "What do you mean?" he asked suspiciously. Rai frowned. "Well, it's lucky that she found the papers, in just one night." The files of the licensing office were epic. They had nearly a tensquare of building square footage already, tightly packed with documents stretching back to the ground-breaking of Affamarg and stacked three stories tall. There were footings down for three other file buildings of similar size, looking ahead to decades of bookkeeping as the regional capitol. Bai scowled, and even though Rai could not have seen his expression, the merchant quickly raised both hands in a gesture of peace. "No offense, but even if you trust her, that could be the kind of question you get! She did have access to the stamps and papers and inks all night, right? At the least, she could have bought false documents and planted them in the files!" The idea left Bai momentarily speechless. "You can't be justified!" he said, when he could. "That's the most time-blasted, crazy idea ever. I'd be unlicensed before I'd believe that of Ressa. Not for a moment." This was not a new disagreement; Bai very commonly had more trust in people than Rai did, and they often butted heads on this and similar points. "She just knows those files backwards and forwards, like no one else," Bai insisted. "She could have found our justification forms, given just a night." Rai backed off, but Bai left Rai's shop in a subdued mood, unexpectedly concerned by this unsavory idea. He had been all right with the idea that people might believe he'd done something illegal in not alerting the Monitors earlier. He wasn't all right with the idea that Ressa would. Rai's point that other people might assume she did rang unnervingly true, and Bai could not help but remember her gentle encouragement to stay quiet about the boy until the following day. It was in this nervous mood that he arrived at his rendezvous point with Amaroin and his grandmother. When it began to drizzle, nearly an hour later, Bai finally had to accept that they weren't coming. He knocked forlornly on their door, but there was no answer, and no lights glowed from within. This faith had been misplaced, and the woman and her hapless grandson were probably on the rail already, or fleeing the city on foot, if they could not obtain or falsify licenses to travel. It was probably the smartest thing they could have done, given the situation as far as they could see it. A poor, Purist life together, scrabbling at the outskirts of the Empire, was probably preferable to a life apart within it - especially as they would both be penalized for their misconduct. The grandmother might have lost the housing license, for the act, and Amaroin would certainly be removed to an orphanage. The irony, of course, was that their flight was for nothing. The rooms were theirs legally, and Amaroin was a thick piece of paper and a tattoo from being a citizen, entitled to all the opportunities and riches of the Empire. His grandmother might receive a reprimand, perhaps a black mark on her license, but they would be safe. Because they hadn't known - because his system had failed these people - they were likely to live out their lives in poverty and hardship. Bai shivered. He hadn't dressed for sitting out in drizzle, and he sighed as he heaved himself off of the bench in the courtyard. He would call the Monitors and start the investigation, even though he knew that they would find the rooms empty and the grandmother and child long gone. As he left the courtyard for the Monitor House, a scrap of color caught his eye, and he backtracked several steps to look behind a decorative bush. Without a second thought, he braved the prickly branches and after a moment of struggle, emerged with the prize that he'd spotted carefully cradled in his hands. It was the paper butterfly that Amaroin had been playing with the day before, soggy, and limp, with its colors running together like a sunset. 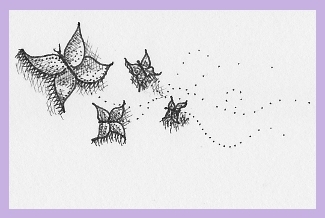 This story is part of a trade with Lorna Cowie, who wanted to see the aftermath of Paper Butterflies; Only Paper. Is this the end of Amaroin's story? Stay tuned to find out!